Radiographic testing is the use of x-ray and gamma radiation technology to produce images onto film or imaging plates. 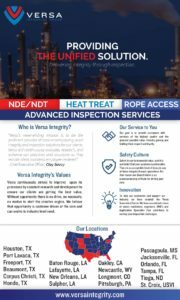 Versa employs Radiography Testing to determine the integrity of piping and welds made by fabrication shops, refineries, and offshore companies, and to protect the communities, employees, and the environment in which these pipelines are placed. Computed radiography (CR) cassettes use photo-stimulated luminescence screens to capture an X-ray image, instead of traditional X-ray film. The CR cassette is inserted into a reader to convert the data into a digital image. Imaging plates are used with the same radiographic inspection methods and techniques as film and are available in different system classes (image quality) which require different exposure times. In utilizing Computed radiography, the image quality is slightly better than that of conventional. We employ the most appropriate technique to fit our clients’ needs. Digital radiography (DR) systems use active matrix flat panels consisting of a detection layer deposited over an active matrix array of thin film transistors and photodiodes. With DR the image is converted to digital data in real-time and is available for review within seconds. DR improves workflow by producing higher quality images instantaneously while providing two to three times more efficiency than CR. Real-time radiography has become an excellent NDT method for detecting corrosion under insulation (CUI) and high temperature Sulfidation corrosion (HTSC). Real-time radiography with the LIXI Profiler measures the attenuation of a highly-collimated radiation beam. This highly-collimated radiation beam allows exact calibration of the real-time radiographic profiler to a known material standard. This, in turn, means we can convert the amount of radiation (gamma rays) received into a meaningful measure of thickness (hence real-time radiography application for wall thickness readings). Furthermore. The LIXI Profiler equipment comes with different arm sizes to fit the device around a multitude of pipe diameters. Significantly reducing the time necessary to set and reset the profiler. 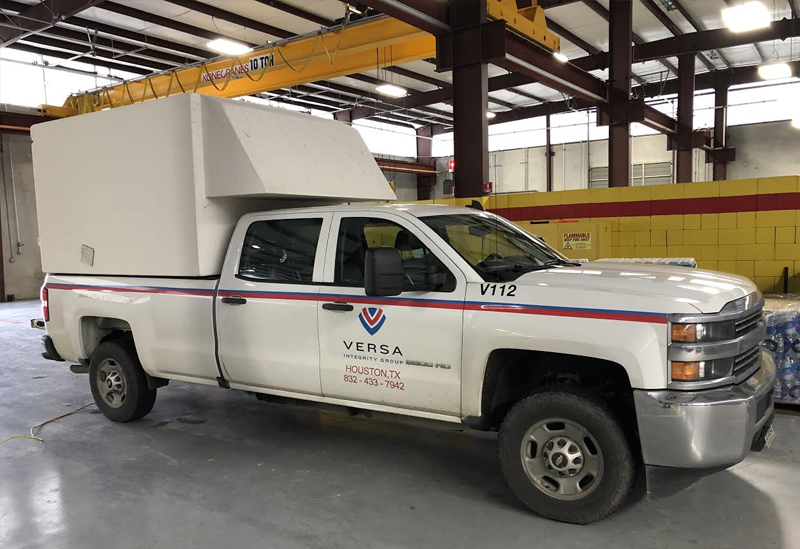 To continue along that thought above, our company was founded on radiographic testing (RT) and engaged in a tour of service that lasted over 40 years in the Louisiana area. We have several ASNT Level III technicians that are dedicated to continually train and work with other technicians to elevate their capabilities. We value having a broad range of ASNT certified radiographic technicians that can be used in each unique capacity you require. Lastly, we are licensed to handle industrial isotopes including: Iridium 192, Cobalt 60, Selenium 75, and of course our X-ray machines themselves.